I have to confess that I've never fully understood the desire to shower outside. I can understand wanting to rinse off sand, pond water, muddy feet from a day spent by the water but for me nothing compares to the comfort of indoor plumbing. 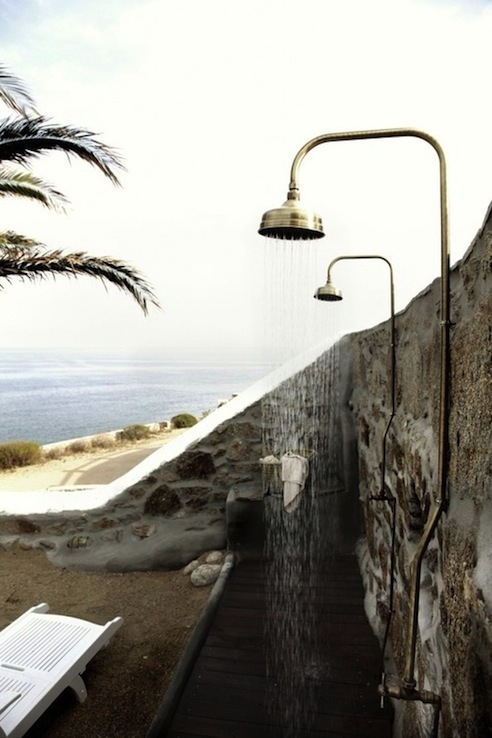 The only time I found outdoor showers cool was when I went to sleep-away Marine Camp as a pre-teen. Yes, Marine Camp. That's the only sleep-away option for Southern Floridians. The little outdoor cabana showers were a fun for an eleven year old (and welcomed sight) after longs days spent by the water, on the water or snorkeling in the water. 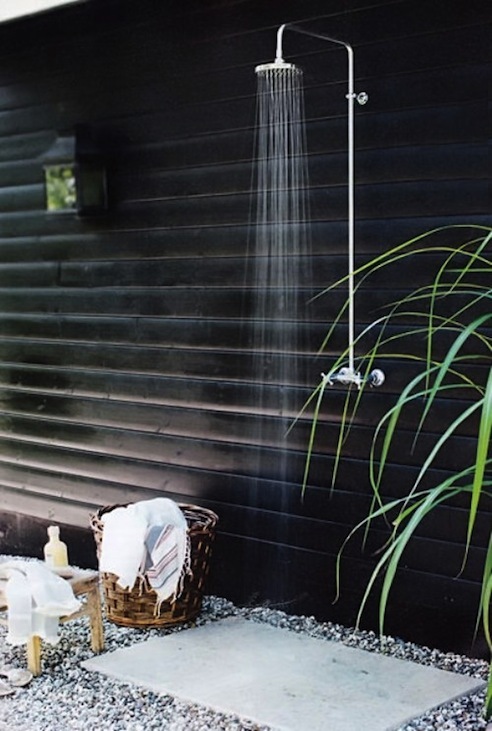 But lately while "researching" on Pinterest, I've found a few outdoor shower options that even I'd consider using - even if it's only a quick rinse! 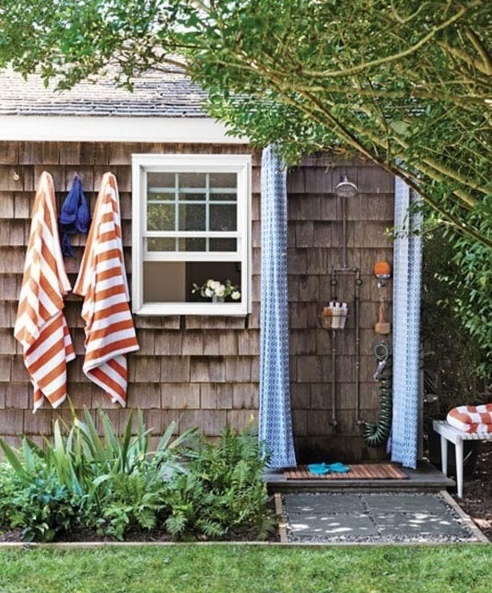 The traditional New England outdoor shower - love the wrap around curtains instead of a fenced in cubicle. Much more charming! This shower is sleek and awesome though I do hope it's meant to be just a rinse-off station. Or the house is so remote that there are no nearby neighbors. Or maybe the owners are naturalists? Something about this image is calling too me. 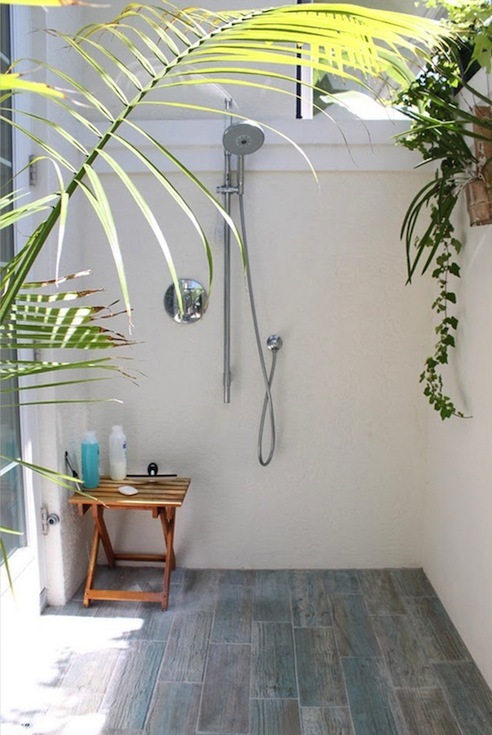 It may be the palm tree peaking into this outdoor shower. As a Florida native, I can't resist a palm tree. I also admire the use of ceramic faux bois flooring.